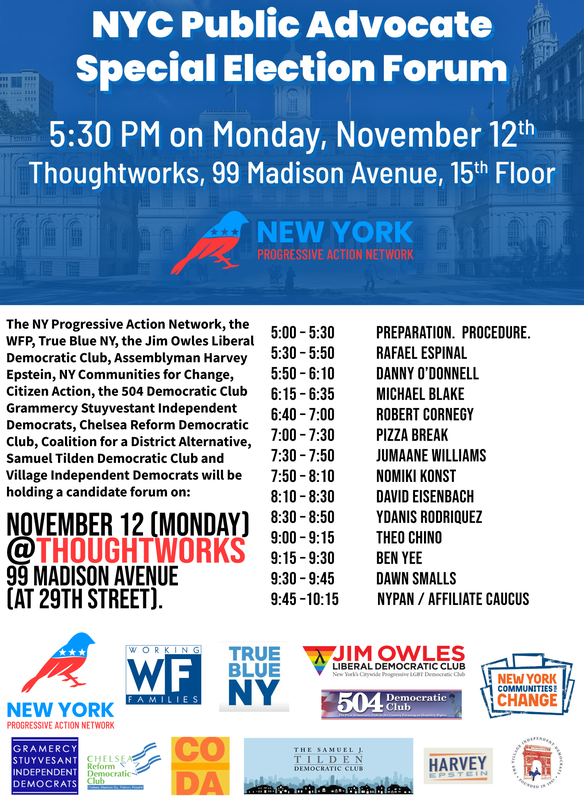 Monday, November 12th at 5:30- 9 pm at Thoughtworks, 99 Madison Avenue (at 29th Street). 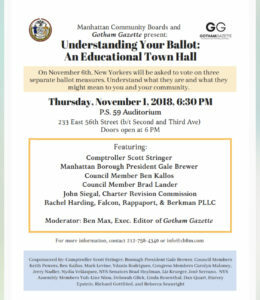 Nine candidates or potential candidates have confirmed their attendance. What an exciting election day! Thank you for all your hard work these last few months. Without your support, we could not elect our Democratic candidates. 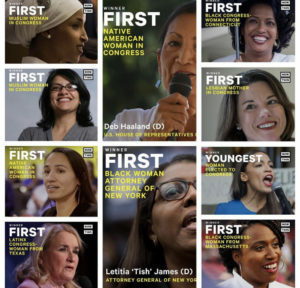 We have the House and so so many FIRSTS with a diverse group of Democratic women in the lead! 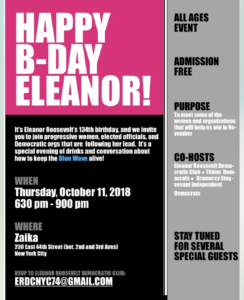 Monday, November 11th at 5:30- 9 pm at Thoughtworks, 99 Madison Avenue (at 29th Street). 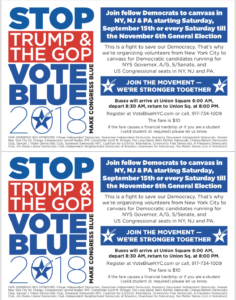 Join us on Vote Blue 2018 Bus Saturdays! US Congressional seats in NY, NJ and PA.
depart 8:30 AM, return to Union Sq. at 8:00 PM. (valid student id. required) please let us know. We are partnering and supporting several initiatives throughout the City supporting Blue candidates near and far. We have one month until the midterms and a team full of drive and with the power of the people to get Democratic candidates elected. 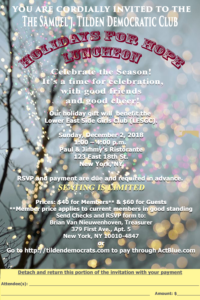 Sister District NY12-13-14 If you recall, Sister district came to our general meeting in the Spring. They working hard to support Tina Davis Democrat for Pennsylvania’s Senate District 6. Saturday, October 20, Sister District is offering free transit to visit Bucks County. PA and knock on doors to talk about Tina. Thier bus leaves Midtown Manhattan at 8:30 am and gets you home by dinnertime. Join them! they are making this trip in partnership with other local teams and with EMILY’s List, so seats are filling quickly. Grab yours today! Facebook initiatives: Leadership at Sister District HQ have kicked off an experiment testing whether folks become likelier to vote when an activist tags them on Facebook. They’re testing this idea in four states including Pennsylvania. If you’re game to tap this turnout possibility, read this primer. Then sign up by midnight on October 11 and prepare for training the next day. This Wednesday, October 10 we will phone bank for Antonio Delgado, the candidate for CD19. Sign up here! This Thursday, October 11 we will phone bank for Antonio Delgado, the candidate for CD19. Sign up here! We will also be calling for CD22 candidate Anthony Brindisi on Thursday October 11. You can sign up here! GOTV Weekend(S) The GOTV (Get Out The Vote) period are the three days leading up to election day and election day itself. These are the most important days of the campaign and we now have the full schedule for those who want to Flip the House! Along with this, the two weekends prior to GOTV will serve as dry runs. Please sign up to either canvass or phone bank below to help Get Out The Vote! We will continue to send reminders out. Let us know if you’re hosting any events so we can also share them. Hope you are having a wonderful Fall! We still have much to do to help flip districts blue! In addition, NY Dems is organizing several phone banks and we all will be participating! This Wednesday, October 3 we will phone bank for Perry Gershon, the candidate for CD1. Sign up here! This Thursday, October 4 we will phone bank for Antonio Delgado, the candidate for CD19. Sign up here! Now that the state primary is over, we can concentrate on electing Democrats up and down the ballot. We will be having phone banks for Congressional candidates every Tuesday, Wednesday, and Thursday from 6PM to 8PM at 370 7th Ave, 14th Floor until the November 6th election. The last two weekends of October (10/20-21 & 10/27-28) will be Weekends of action before the Final 4 days of the election for GOTV. Mark your calendars and look out for more information soon! Judges have been nominated as Democratic candidates for NYS Supreme Court-Lynn Kotler, Alex Tisch and Mary Rodado and will appear in the November ballot. Calling all Voter Protection Volunteers! 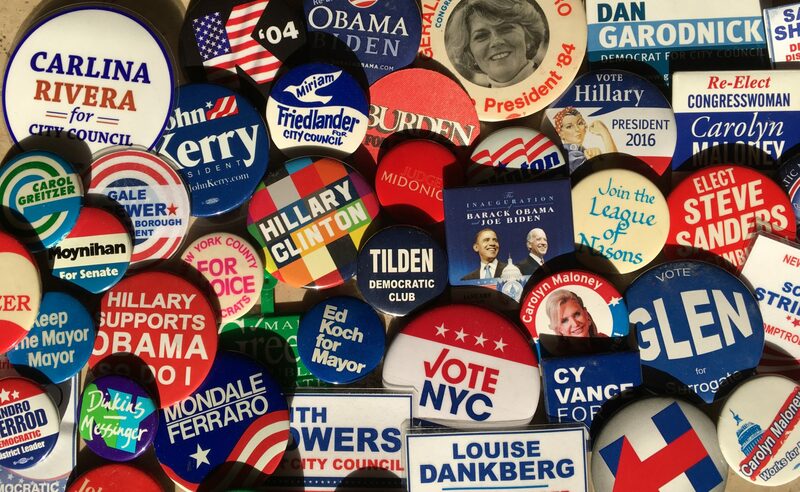 NYDLC is working with Democrats across New York to protect the civil rights of ALL eligible voters on Election Day (11/6) and we need your help to monitor the polls in top priority Red-to-Blue Congressional and State Senate contests.